These bags are ideal for storing and transporting papers/documents/manuels of all sizes. They are also a great choice for distributing your company information or any type of printed material that you may compile which may given out to present of potential customers. If you manufacture or sell a product that would have accompanying documentation, these style bags do a wonderful job! 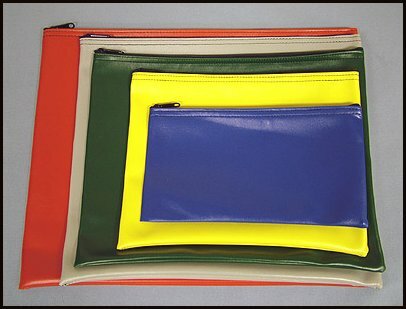 These bags are made from a very durable and long lasting textured ( leather like look ) vinyl which will last for years. They are available in 23 different colors choices. We can imprint the name of your establishment (s) or any message you desire. Most common are the name, address, city, state, zip code, web site and most importantly your telephone number. We can imprint any custom artwork or logo you may have developed for your business. We also have clip art that coincide with thousands of businesses and industries. There is no charge for the basic setup and type setting that you may require to complete your intended objective. There is a plate/screen charge on orders of 125 or less. We would be happy to help you with the layout and design of any and all bags that would help make a professional presentation. Please inquire with your needs and we will provide you with pricing on the bag that would best fit your needs.